Plant visit to Malay-Sino Chemical Industries Sdn Bhd, located at Jalan Lahad, Ipoh, Perak Darul Ridzuan is the second time for me. For the first time, I have joined the cheme carnival 08 plant visit organized by ICHEME student chapter UTP. However, for this time, it is organized by my lecturer Dr T. Murugasen for Spearation Process Course. Malay Sino Chemicals offer a complete range of high quality chlor alkali. These are available at competitive prices and packaging. Based on few simple chemical equations, Malay Sino manages to handle a complex and complicated process plant that produced the desired products. Generally, the function of the plant is to produce sodium hydroxide or caustic soda (NaOH). This is their main products. Raw material such as sodium chloride (NaCl) is used as the main feed. But, from the main operation we will get other side products that are useful. So, the Malay Sino did not waste them and extend their operation to process the side products and gain more products for marketing. FIRC - Friends of Information Resource Centre was establised in 2008. IRC Open Day is the first event that conducted under Friends of IRC (FIRC) to attract students come to IRC. Platform to promote IRC among UTP students, school students and outsiders. 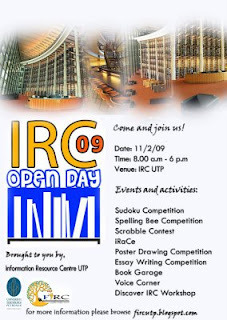 IRC Open Day is the first event that I've joined in UTP as the organizer commitee. For this event, I got opportunity to gain new knowledge and experience especially when I received task as person incharge (PIC) for iRACE competition. "start to learn something that i cannot obtain during lecture time"
REAL Undegraduate Conference 2009 is the second time conducted by REAL LEADERS. So, this kind of conference for me is quite good to improve personally especially in communicating and others aspect of life. This program involved all over universities student in Malaysia and also foreigner students from certain university. Here, I would like to share the important inputs from the speakers that we should practice in our daily life. When we work with others especially in team work, we should have clarity in whatever we do. The way we speak must be understand by others. All this things are important to avoid from any miss communication. "The pass cannot be changed, the future is still in your power"
This quote gives me 1001 meaning to interpret and apply in my daily life. Once we are failed, we are not always fail. We can be succeed in the future because all the decisions are ours. "Make prudent financial management our way of life"
The quote clearly shows that we should manage our financial in a correct way. From this conference, I knew a little bit about how to save our future salary and the importance of our saving. The important thing is we should know to distinguish our needs from wants. BAD ATTITUDES, LEFT ALONE, RUIN EVERYTHING! "If you leave a bad apple in a barrel of good apples, you will always end up with a barrel of rotten apples"
2: the book that you read! "Never ever let people say you are not good enough"
The quotes is an advice from Dr Rosti that we should take on consideration when we are working in a group. In order to avoid from people say we are not good enough is try to be a good person, give full commitment and give the most contribution in our group. "The conduct of successful business merely consists in doing things in a very simple way, doing them regularly, and never neglecting to do them"
"Either you network or you are not working"
"Be mentally tough, physically fit, emotionally intelligent"
REAL Undergraduate Conference is a best conference. I got many new experience and new knowledge. Hopefully, I'll be able to practise and implement all the inputs that I got from the conference in my daily life. Besides, I'm really hope I'll use them for my future career and also for my future life. A good platform for FIRC members to act as ambassador between IRC and students. 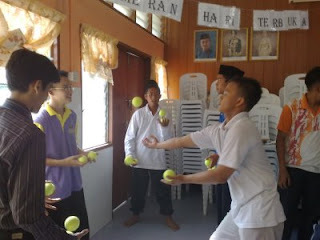 By this activity, I got new experience. Besides, to have such great moment with school students is like a good opportunity for me. "We gather, we share, we assist". Let's have fun I - "My self portrait"
Let's have fun II - "Ready, set, juggle"
Let's have fun III- "nail them all"
Family day for FIRC this time is not the official one. It's more to have joy before semester start. Congrats to all my group members. We are the champion for the FIRC bowling tournament. Seminar for all FIRC members by Kak Hanis (Nur Hanis Binti Abdul Hamid), secreatary 1 of FIRC. Frankly to say, FIRC is the first organization or event that I've joined at UTP. FIRC is the best platform for me to learn more about leadership, commitment, build networking and soft skills that cannot get in class or lecture session. I'm not regret to join FIRC although my free time become less, my sleeping time not enough and my study time quite limited. I believe that these challenges will teach me to become a good students not only in academic but also in non-academic matters, insyaAllah.